Please come join us for with Gathering Time at 8:45-9:00 a.m. with ​classes to follow from until 9:45 a.m.
on Sunday, April 14th during worship. All children are invited to proceed into service waving their psalm branches. Watch for further information. WATCH for upcoming event information about the Morningside Days Parade on May 16th. And our Camp Sunday May monthly activity. April Bible Verse- I’ve Seen the Lord! John 20:18. April Monthly Activity will be attending JACK AND THE BEANSTALK at Morningside Theatre on Sunday, April 7th. Please join us for lunch following worship and then we will walk over to see the show. Please let Jan J. if you plan to attend. ​Please join us on Wednesday evening from 6:30 – 7:30 p.m. All preschool – 5th graders are invited to join us for games, crafts and Bible lessons. Come join us and invite others! Household Cleaners collected on April 7, 14, 21 and 28th. SUNDAY SCHOOL- Special Invitation to all children and youth to come join us on Sunday mornings. We want to reach and teach your children in such a way that they have the greatest opportunity to become devoted followers of Jesus. In Children’s Sunday School, your kids will worship, learn and have fun at their own level. Gathering Time in room 102 on the lower level for preschool – 5th grade is from 8:45-9:00 a.m. with classes from 9:00 – 9:45 a.m. Please come be with us. Once again this year we will go on DEEP BLUE—LEARN AND SERVE. Asia, Edgar, Kat and Caleb will be joined by Carlos from Guatemala, Armen fro Armenia, Mercy from Kenya and Aurora from Alaska. ​Please come join us and invite others!! Our Grace United Methodist Church nursery is open on Wednesday evenings and during Sunday school time and during Sunday morning worship for children newborn through kindergarten. Once a child reaches first grade, they are encouraged to participate in worship with their parents (grand). Please include any nursery age children on the Sunday School registration at the Kick-Off on Sunday, September 9th or complete a registration form in the nursery. The people of Grace United Methodist Church invite you and your entire family to become involved in the exciting Children's Ministry at Grace. Our congregation offers a variety of activities to help your children grow in their faith, in their fellowship with other children and to enjoy the exciting opportunities that children of all ages have here. For more information on our Children's Ministry, please contact Jan Jacobsen, Director of Children's Ministry at 712-276-3452 or jan@gracesiouxcity.org. Gathering Time is from 8:45—9:00am followed by Sunday School from 9:00—9:45am each Sunday morning September thru May. 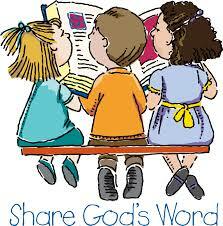 Sunday school is available for children preschool through the 5th grade. JAM (JESUS AND ME) is our Wednesday evening programming from 6:30-7:30pm for children from preschool—5th grade. Come join us for games, crafts, science, skits and more. JAM is located in room 105. Each month children are invited to participate in a Children’s Ministry Activity. Activities include: Harvest Party, Make It & Take It, Story Time (Readers Theatre), Game Day, Comfy Cozy Day, Spring Fun Day, Camp Grace & Fun Time Theatre. For dates and times please check the weekly worship bulletin, newsletter and website. Each December children in preschool through 5th grade participate in a Christmas Program. Children enjoy presenting the Christmas story and singing songs. Each Spring children preschool through 5th grade participate in the Spring Skit. Children enjoy presenting a skit in which they sing and tell stories from the Bible. Although the Sunday School curriculum does take a summer break, there are still plenty of opportunities for your children to enjoy the summer Sonshine of Grace. Here’s some of the Summer Stuff we’ve got planned. Church Camps are available to children of all ages. Whether it is a day camp for younger kids, a week-long camp for older kids, or camp for the whole family, summer church camp is a great way to spend some time getting to know Jesus better. Camperships are available.